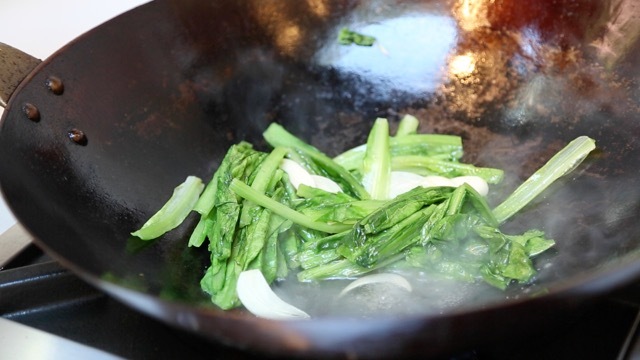 Taiwanese A-Choy is a very popular leafy green vegetable in Taiwan and it's often served blanched or in a garlic stir-fry. I really like the garlic stir-fry version because it's simple, crisp, and is a healthy family style dish. On the weeknights, I'm able to prep and cook this dish in under 10 minutes which makes it a convenient dish to get your daily dose of vegetables. Where to buy A-Choy? You can usually find this at your specialty Asian grocery store, but it's not as common as Nappa cabbage or Baby Bok Choy. Sometimes it's known as Taiwanese Lettuce but you can also ask your local Asian grocer for A-Choy ~ they will know what this is. 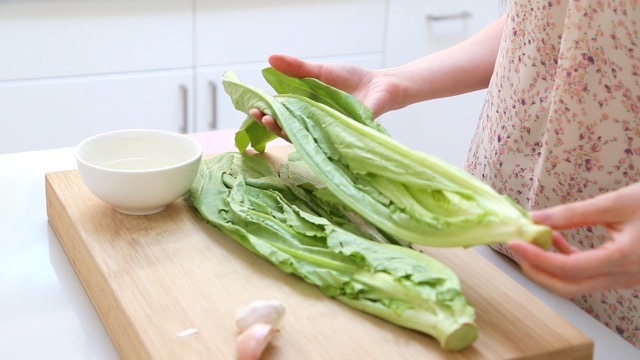 Tip: You will need a bit of liquid (water or chicken stock) to help cook the vegetables. Be careful not to use too much liquid, or else the veggies will "boil" and this dish will turn out soggy. Prep Time = 7 min.